England boss Mark Sampson was cleared of wrongdoing after Eniola Aluko made a complaint to the Football Association about "bullying and harassment". Aluko, 30, has not been selected since making the claims in May 2016. The Chelsea player said she also felt "undermined and belittled" by England staff and claims their negative bias contributed to her not being picked. But the FA said an independent report found no evidence of wrongdoing by Sampson or his staff. In a statement on Tuesday, Aluko confirmed she and the FA agreed a settlement earlier this year. BBC Sport understands Aluko was paid £80,000. 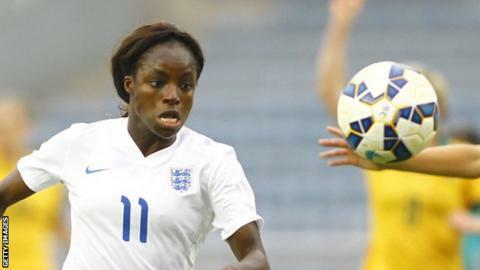 Aluko added she has "not quit the England team", despite not having played for over a year, and that she remains a centrally contracted England player. The FA said Aluko was not "precluded from speaking about the facts of that complaint" and it agreed "a mutual resolution" to avoid disrupting the England squad's preparations for Euro 2017, which finished on Sunday. England were knocked out of the competition in the semi-finals by eventual winners the Netherlands. The case sheds light on the confusion surrounding Aluko's England career, which has stalled over the past year despite her being the Women's Super League One top scorer in 2016. Aluko, part of the England team that won the bronze medal at the 2015 World Cup, has 102 caps and has scored 33 international goals, but last played for her country in April 2016. A qualified lawyer, Aluko became the first female pundit to appear on Match of the Day and worked for Channel 4 in the same role during Euro 2017. Allegations made by her include accusations of staff calling her "lazy", Sampson belittling her in front of the squad and what she says are "false claims" by Sampson of "bad behaviour". In the complaint, Aluko said: "It is inevitable that such damaging behaviour and bias from the ultimate leader of the group in the presence of my England team-mates will and has influenced other staff and team-mates to be empowered to also attempt to undermine and belittle. "I submit that this is the basis of a culture of bullying and harassment." She added: "Although I am well adjusted to the final decision of a manager, I submit that Mark Sampson's negative personal behaviour towards me has led to inconsistency, disparity of treatment and confusion regarding the criteria for team advancement." The FA commissioned an independent investigation conducted by a barrister, Katharine Newton, which started in December and concluded in March this year. Newton also wrote to Aluko to "ensure complete transparency and objectivity of the findings", the FA said. Sampson was appointed England manager in December 2013, replacing Hope Powell who had been in charge for 15 years.